As I boarded the Megabus at South Station in Boston for my second overnight bus trip in a row (after having a brief moment of panic when I arrived and didn't see my bus on the Departures screen), I started to rethink the intelligence of this part of the trip. Maybe it wouldn't have been such a bad idea to spring for a hotel in Boston for the night. Actually, scratch "maybe." But no matter. I was on the bus and though we were a few minutes behind schedule, in a few hours I'd be home and, since I didn't need to catch my bus to Philly until 12:45, I could add to whatever sleep I picked up on the bus with a few hours in my very own bed. So I leaned my head against the window and looked to get a jump on my bus sleep. I heard people talking about something as I drifted off, but I was sufficiently dead to the world that it didn't bother me much. Then, after a few minutes of rest, the talking got louder and I heard someone's name being spelled out and a phone call being made. OK, I'm up. Kind of. It turns out that because of Megabus's bad-things-are-bound-to-happen-with-this policy of not providing tickets (you can either show them your receipt on your mobile device or print out the receipt and bring it with you), the driver was trying to confirm that a woman who had changed her reservation but figured she didn't really need any proof of that before boarding was in fact allowed to travel on the bus. The woman in question seemed largely unfazed by the proceedings and instead blamed the whole situation on the driver's poor command of English. Finally, after sitting in the station for about 45 minutes, everything was resolved, the woman got to stay, and we were on the road at about 1 a.m. And once we were moving, my plans for sleep quickly went away, though I probably picked up maybe a half-hour's worth of shuteye in Massachusetts. But once we got to Connecticut, it was sleep for a minute, wake up, look out the window for a highway sign, realize we were still in Connecticut, and then repeat the cycle for the next three hours. I seem to recall arriving in NYC around 5:30, about an hour behind schedule. So by the time I got the PATH train and back to my apartment, it was closing in on 7 and what looked like a nice window for decent sleep was now about four hours. Super. But I did it and made the Megabus to Philly with plenty of time to spare. And, when I got to Philly, I had a few quality hours in one of my favorite cities, mainly spent sitting and eating at one of my favorite places on earth, the Reading Terminal Market (though being there on a Friday during Lent was kind of torture...next time, DiNic's, next time). Then it was off to the first set of one of the last weeks of the John Train Winter Residency at Fergie's Pub, another of my favorite things about Philly. I saw a few Marah fans from back in the day and was happy to hear John Train's cover of Butch Hancock's "Boxcars" before walking up to World Cafe Live for the night's Amy and Rich show. I hung out with the Dude at the merch table for a while before the show as he extolled the virtues of his pulled pork with cheese sandwich (the cheese was his addition, and he was quite proud of coming up with it) and then headed inside to see Amy and the guys play. It was another good night for them, and there was a reasonably steady flow of sales at the merch table afterward, where I also talked with Amy's friend radio DJ and Dylanologist Michael Tearson for a while. I am sad to note that I only discovered now that he was in the movie Wise Guys (Captain Lou Albano's shining moment on the big screen, as Frankie the Fixer), which actually is probably good for him, because I would've talked his ear off about that. As it is, we stuck mostly to Dylan. Unfortunately, the evening also brought another Merch Table Faux Pas. Musicans, I'm guessing, generally like to hear that you enjoyed the show. And if it's your first time seeing them, they're probably even more excited to hear that, because it means this touring thing is actually working. However, it would be nice if you didn't start off your well-meaning compliment with "Wow, this was a total shock!," as someone did in Philly. I know you mean well, and I admit that I once said something similarly well intentioned to Kristen Barry at Maxwell's ("I enjoyed you so much more live than on your CD," which still makes me cringe when I remember it, especially since it was the same night I told Pete Droge I hated the band that came on before him the last time I saw him, which turned out to be a band he loved). But, as a general rule, it's best not to provide a preamble that establishes how much you thought the musician you are now complementing was going to be terrible. I cannot speak for Amy or any other musician in a similar situation, but I think it's reasonable to assume that they hear what I hear--namely, "I came to this show headlined by a band I like completely dreading, you, the band opening for the band I like, because you are not the band I like and therefore could not be another band I might like. Imagine my surprise when I discovered you are good! Huzzah!" I got to see a good portion of Rich Robinson's set after the merch rush died down and, though I'm not much of a guitar jam guy, liked what I heard (which, If I were at the merch table talking to Rich Robinson, I would phrase "I liked your set"). We got a few more customers after the show ended, and, after Amy told me that Saturday was Dave's birthday, I volunteered to pick up a cake in NYC in the morning. I suppose it would've been easier to get one in DC, but I feel confident that NYC is a better cake city than DC. Yeah, I said it. You're not impressing me, Georgetown Cupcake (plus you're here now anyway). And then, with the overnight buses now behind me, it was off to 30th Street Station, to pick up my SEPTA train to Trenton, which would take me to the NJ Transit train in Trenton, which would take me to the PATH to Newark, which would take me to Jersey City and home, and dreams of the Burporken at the Red Palace in Washington, DC. 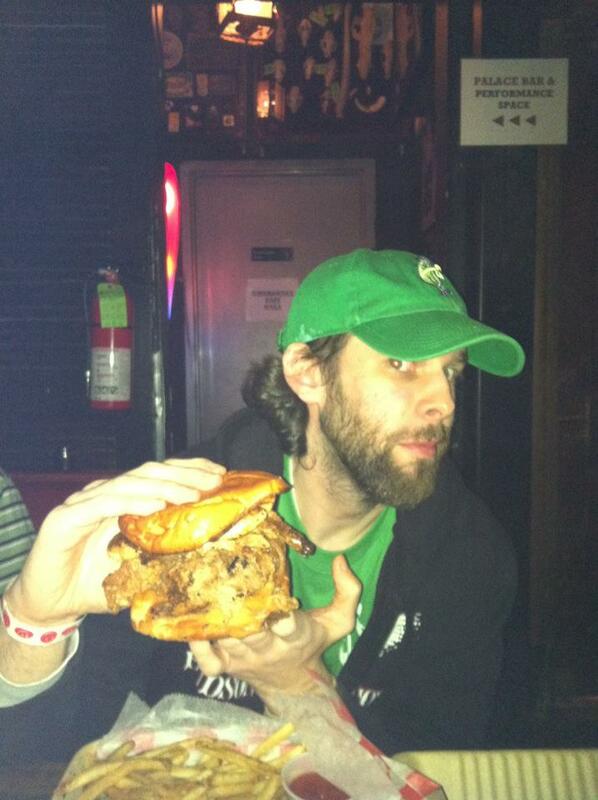 I was intrigued by the Burporken from the moment I noted its inclusion on the website for the Red Palace in Washington, DC, where the Amy and Rich show was due to play on St. Patrick's Day. I'm not really a gluttonous, Man vs. Food kind of guy, but when presented with a "beef burger, topped with pulled pork, topped with grilled chicken," I became intrigued. You may replace "intrigued" with "disgusted" if you wish. Perhaps you will be proven more correct when you outlive me by a few decades. We'll see. 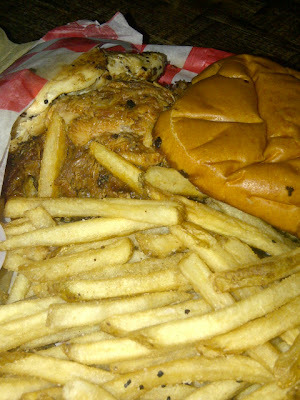 In any case, I made the decision that the Burporken was for me. So I began hyping myself up for it and, all things considered, didn't really eat all that poorly in the days leading up to the Burporken adventure. Visions of it would have danced in my head had I been able to picture what it might look like. I couldn't quite wrap my head around it, and assumed wrapping my jaw around it would be a challenge as well. But I was still about 10 hours away from my Adventure in Meats when I left my apartment and headed into NYC in search of a birthday cake. I did some advance scouting on the Web in the morning and settled on one of two places. The first, Billy's, refused to sell me a whole cake, which, I suppose is their prerogative. So I headed to bakery #2 (which really should've been #1, because I knew they'd have plenty of cakes they'd be willing to sell me), Ruthy's in Chelsea Market. The only snafu I ran into came as the woman taking down my order wrote down what I wanted on the cake (an order, I should point out, I volunteered to write myself). She was not as well versed on punctuation as I'd hoped. An apostrophe became an exclamation point. Parentheses became quotation marks. But I thought we had it all sorted out, until the cake came back and had single quotation marks instead of parentheses. At this point, time was of the essence, and I can't be expected to copy-edit cakes on my vacation, so I lived with the single quote marks and headed off to the subway to take me to Port Authority and my Megabus to DC, deftly avoiding St. Patty's Day revelers in the process. When I got to DC, I had a few more St, Paddy's Day revelers to dodge on the Metro, and then I met up with my friend (and world-class lawyer) Abby for a late lunch/pre-Burporken celebration at the Afterwords Cafe in Dupont Circle. We caught up on things, watched a dude completely back into a parked moped, and then hung out in a bar for a bit before making our way to the Red Palace in my first and only cab ride of the trip. Unless you count my friends driving me everywhere, which, because they didn't have a meter, I won't. My friend Jesse (outside of family, the human being I have lived with the most in my life...two years in college) graciously extricated himself from his High Holy Days (March Madness) to meet up with us in the downstairs bar/restaurant at the Red Palace (the show's upstairs), and after handing off the cake to Amy, I waited anxiously for my Burporken. And waited. And waited. Fifteen minutes until Amy starts, no Burporken. OK, kid, don't panic. If it comes now, you can power it down. Maybe save half for later. Five minutes to showtime. Still no Burporken. OK, maybe the show won't start exactly on time. Showtime. I walk over to the staircase and hear Amy start her first song. I check with the waitress to see if I can bring food upstairs. She tells me no, and I explain the situation about the show starting and could I maybe just have them hold on to it in the kitchen and I'd come down and eat it after Amy's set (Abby expressed concern that it wouldn't be the same if I had it later; I assured her that 40 minutes wasn't going to really affect the gustatory quality of a bunch of meat smashed together). After explaining that the place is super busy and a bit overwhelmed (which I could've used a heads up on when I ordered...just sayin'), she tells me the Burporken just came up, so I could have it now and take it upstairs, though Abby would have to wait for her order of sliders because she ordered them after my Burporken order. OK, I guess. So Abby, Jesse, and I went upstairs just as the first song ended, with me holding what felt like about five pounds of food in my hand. But I soon put it down on the floor and enjoyed the show, which featured a cover of Leonard Cohen's "Tonight Will Be Fine" for, I think, the first time this trip. The merch area was stage right, and a bit tight, so I might've been a little more in the way than actually helpful. Plus I had to contend with the now-nightly gentle mockery from the Dude regarding placement of prices, how I keep track of purchases, slowness in dealing with customers, and whatever else he felt like pointing out. He later admitted that the needling was part of how he keeps awake (the Dude was also doing the driving on the tour). After the selling was all taken care of (no incidents to report at this point), the moment of truth had arrived. I was about to meet my Burporken. Or my match. Or my Maker. Perhaps all three. I am pleased to report that I finished the whole damn thing (Abby helped with the fries). It was delightful. The chicken kind of gets a little lost, but other than that, no real complaints (and the delay did not affect my enjoyment in the least). It's not something you probably want to eat more than, say, once a year, but, well, I'm looking forward to a trip to DC in 2013. The Red Palace, overall, is a pretty cool place, despite the Burporken delay (I made sure I wasn't being rude or short with the waitress in our earlier interaction and we were cool; I get what it feels like to be overwhelmed). After decimating the Burporken, I waddled back up the stairs to catch the rest of Rich Robinson's set and had similar feelings to the Philadelphia set, though I thought he sounded better in DC, or maybe I just like the room better. And after the show ended, there were a few more sales to make, including to a guy who tried to haggle with Amy and get 2 CDs for $15. Unfortunately, he caught the tour on one of its Non-Buy One, Get One Free days, so he settled for a $10 EP instead. And then it was time to give Dave his cake, which took a little work because Shawn had to get hold of Dave on his phone and tell him to come back upstairs. But he eventually made his way back, "Happy Birthday" was sung, and cake was consumed. And, because there was an inch of space left in my stomach, I decided to fill it with a piece of cake, after which I felt a little dizzy while walking to Jesse's car. I probably should've run to the next show, a 1 pm matinee in Annapolis, and worked off my gluttony, but Jesse had a bed all ready for me, so I stuck with that plan and got some sleep in Alexandria, VA, knowing that the fun was just about over. And by "the fun," I mean the tour, not "my life," for I ate the Burporken and a piece of cake and lived to tell the tale. UP NEXT: A short set in Annapolis, a long journey to a train. and the end.